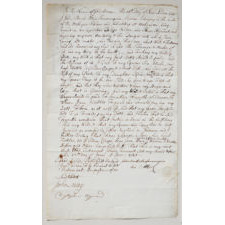 Rare King George's War documents consisting of the last will and testament of the Mohegan Indian, Junsonequin, (Christianized name John Buell) and a note of its' execution upon his death. 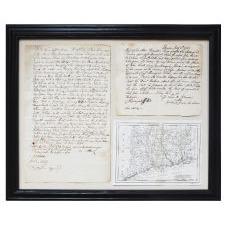 This important early Indian document is historically significant as the last will and testament of an Algonquian Indian, early Connecticut history, Christianity among the Mohegan Indians, Colonial and tribal affairs, probate history, and the valuations of an American Indian's personal effects and material culture. 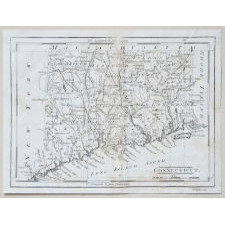 In addition to John Buell, the Mohegan Indian, Jonathan Trumble (Trumbull) is mentioned (It also appears that Trumble may have penned the document) within the document and Sam Fitch, John May, Christopher Raymond, and Adonijah Fitch signed as witnesses. 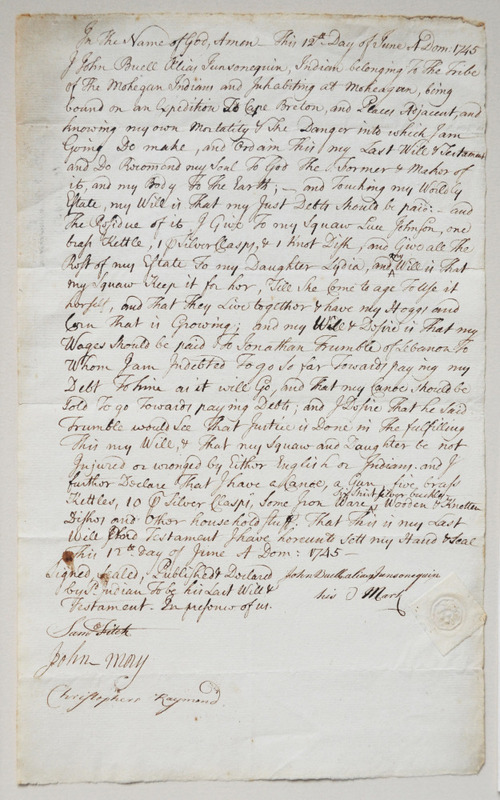 Extensive research has found only one such comparison, that being the last will and testament of the Mohegan sachem, Benjamin Uncas II, also from 1745 (Connecticut State Library). 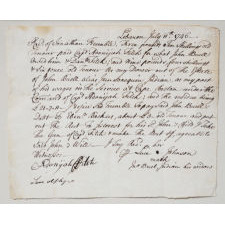 In part the document reads, "I give to my squaw Luce Johnson, one brass kettle, 1 silver clasp, & 1 knot dish, and give all the rest of my state to my daughter Lydia...and I desire that he said Trumble would see that Justice is done in the fulfilling this my Will, and that my Squaw and daughter be not injured or wounded by either English or Indians and I further declare that I have a canoe, a gun, five brass kettles, 10 silver clasps, some iron ware, six shirt silver buckles, wooden & knotten dishes, and other household stuff. 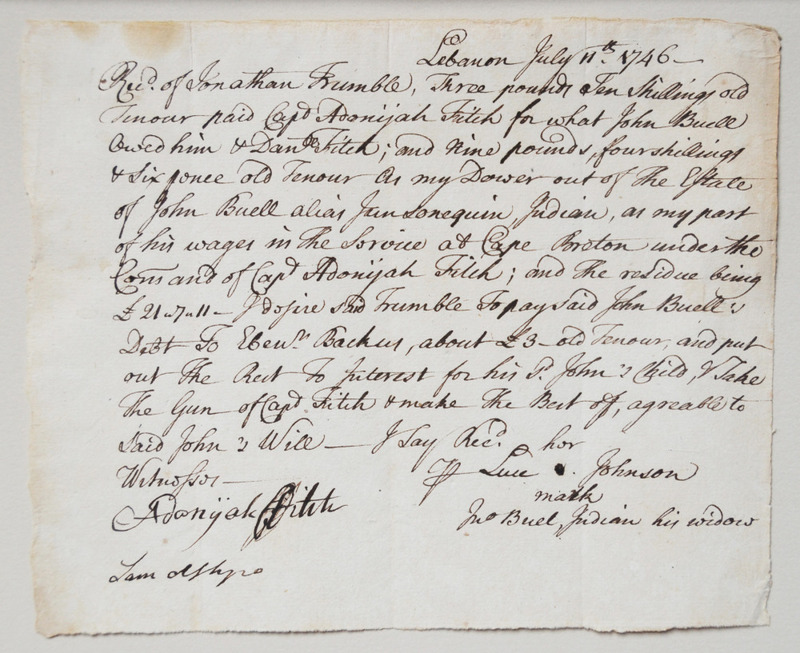 That this is my last Will & Testament I have herewith sett my hand seal this 12th day of June A Dom: 1745" - John Buell, alias, Iunsonequin." For a full transciption of the document in PDF form please email me. 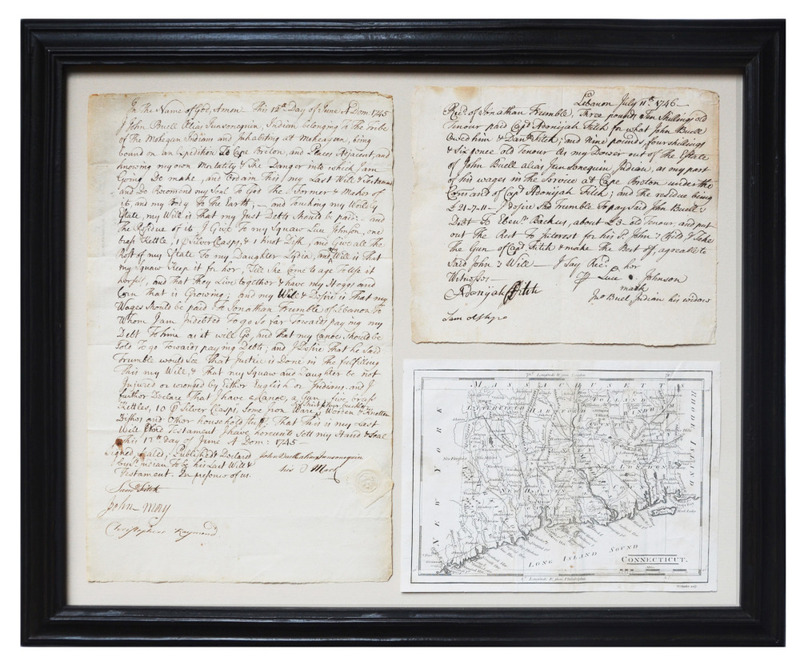 Though we knew anecdotally that Woodlands burl bowls were gifted and passed down from generation to generation, this is the only such document that I have found that records such actions. Condition: Excellent. 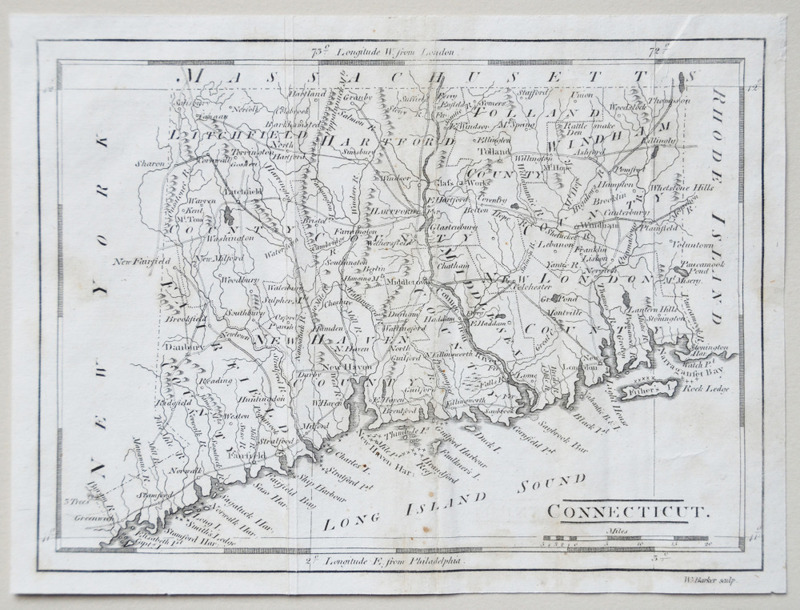 Framed with an 1805 map of Connecticut by Matthew Carey.